Manufacturers wage a fierce battle in the ultimate performance ranks. 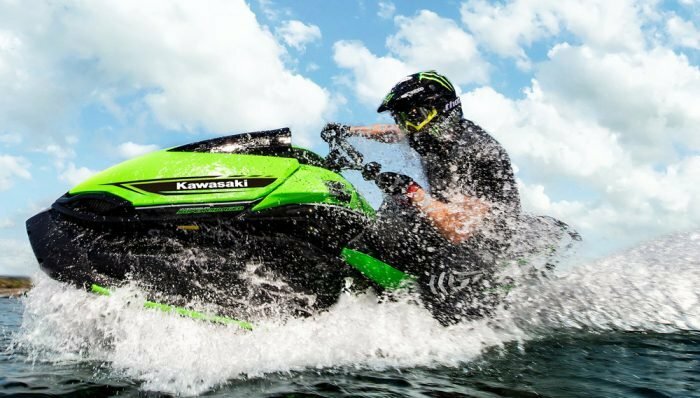 All three – Kawasaki, Sea-Doo and Yamaha – offer up craft that, in the right conditions and with the right pilot, surpass 65 mph and at times come tantalizingly close to the 70 mph mark. All three also have craft that get to that speed in breathtakingly quick fashion. 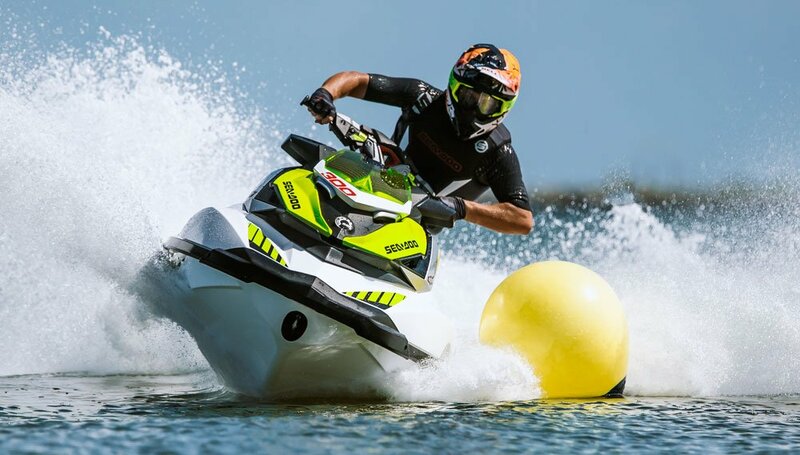 And all three can handle on the race course, slicing through the sharpest buoy turns; real or imagined. 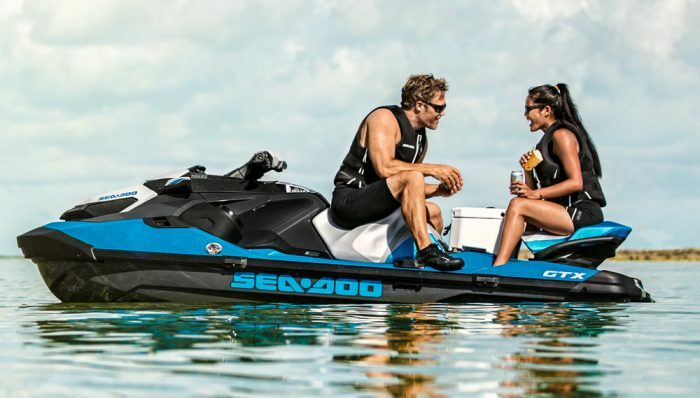 Arguably only Sea-Doo, however, has gone to such lengths to make its craft easier to actually stay aboard at those speeds and in those hard-cornering conditions. 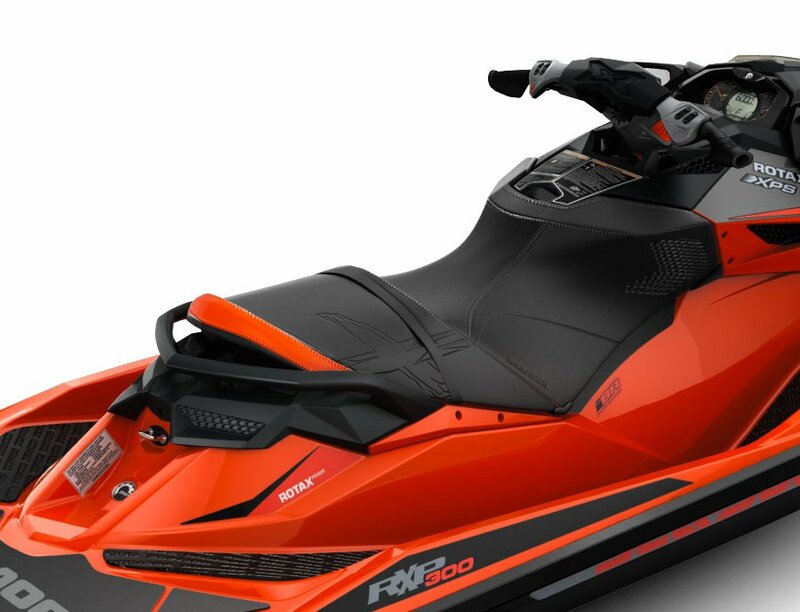 And it’s those lengths – and the concrete features that are the result – that continue to set the RXP-X 300 apart from the pack. All three manufacturers offer hulls that can carve tighter and more aggressively than most of us mere mortals will ever discover. 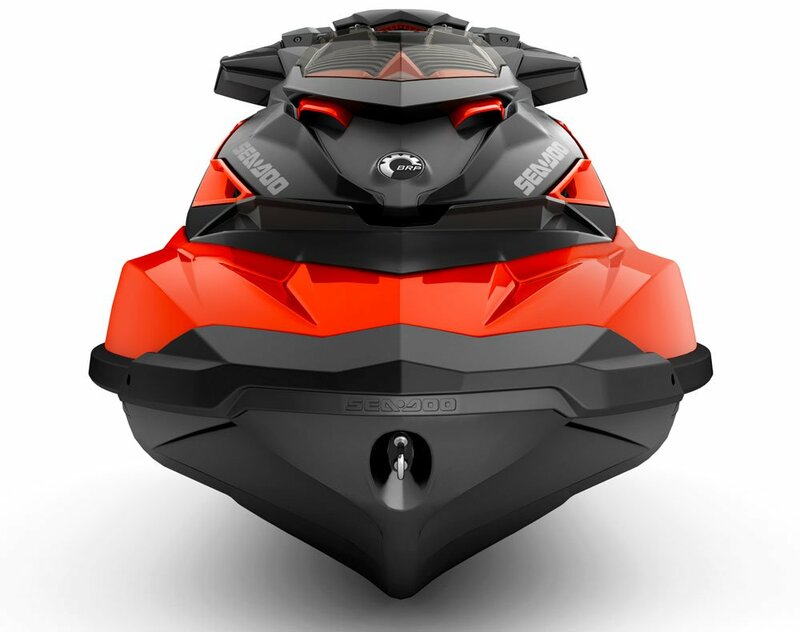 Sea-Doo’s “T3” design vaguely resembles the letter T when viewed from the bow or stern, and features distinct chines at the transom that soften as the lines run forward. The idea is to offer almost a two-part running surface. At high speeds on a straight path, the hull runs on more of the vertical portion of that T, lessening drag and reducing wetted hull surfaces. But when the hull is leaned into a corner, those softer chines toward the bow produce a hiccup-free roll to the side. Adjustable sponsons keep the stern locked in as the boat angles into the turn. 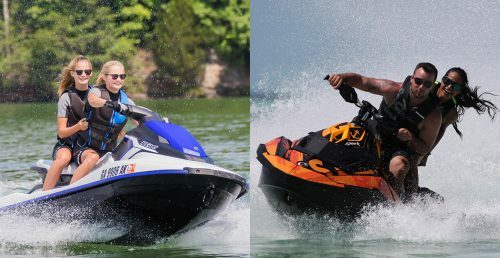 Lean the boat far enough over – and lean it can – and right-angle winglets on those sponsons, similar to those you’d find on some slalom water skis, come into play before the traditional sponson shape loses its grip. 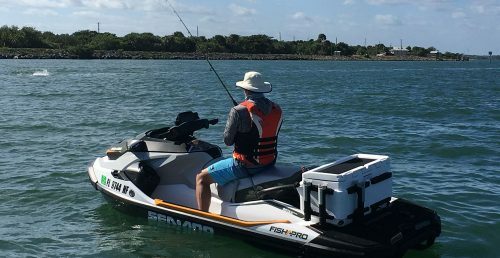 Long story short, the RXP-X can lean into a corner and rail through more aggressively – and intuitively – than nearly any other boat on the market. As any experienced rider knows, however, a craft that corners that hard can be a challenge to stay atop of, especially if you don’t spend a lot of time in the gym. 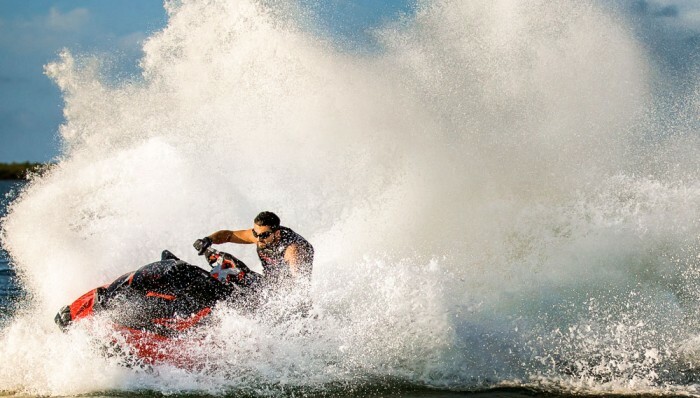 In this regard, Sea-Doo truly separates itself from the pack. The ErgoLock system is a combination of ergonomic features that combine to “lock” the rider in place and, notably, transfer much of the strain of staying aboard the craft from the weaker upper body to the much stronger lower body and leg muscles. ErgoLock starts in the saddle, which slims in hourglass fashion to not push a rider’s legs wide, but instead allow them to take a more natural position. You can even squeeze the seat between the thighs, like a horse’s saddle. Forward bolsters wrap up over the top of the thighs, providing support and cradling the legs. The feet, which following the lower legs naturally cant outward in this position, find angled footwells for leverage. The Adjustable Ergonomic Steering (A.E.S.) handlebars complete the picture, and can be adjusted for angle and even width to further match the rider. Combine ErgoLock features with the fast-responding electric trim with preset memory positions, and the rider can dive into corners at faster-than-average speeds, hold fast where they normally would be fighting tremendous centrifugal force, and exit the turn in surprising control. 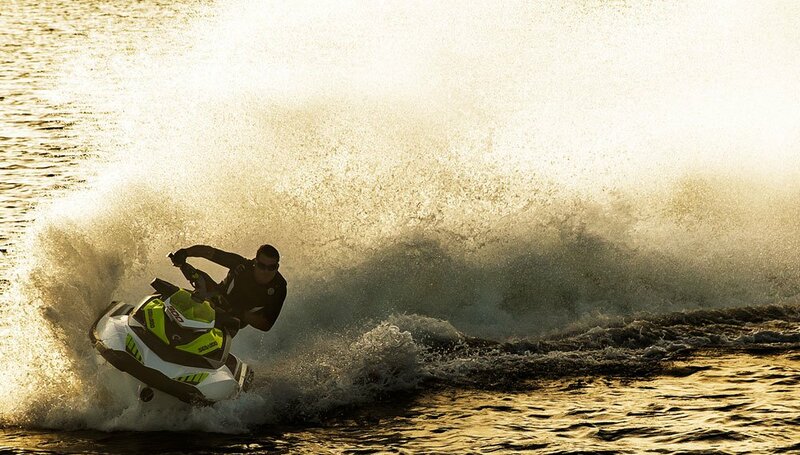 Such control is an impressive feat given the RXP-X’s abundant power. The 1,630cc ACE 300 engine introduced last season gained 9% in displacement over the previous 1503 Rotax by maintaining the engine bore but lengthening the stroke. A host of other improvements – plasma cylinder coatings, redesigned pistons and connecting rods, new ignition system, cylinder head and larger injectors – improved both performance and reliability. A larger heat sink, additional cooling circuit, more efficient intercooler, and new maintenance-free supercharger further add to the engine’s potential. Top speed from this 300hp beast? 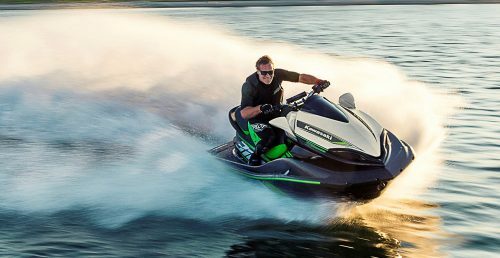 Sea-Doo limits it electronically to 67 mph to keep things kosher with the Coast Guard, but the craft gets to that speed lightning fast. 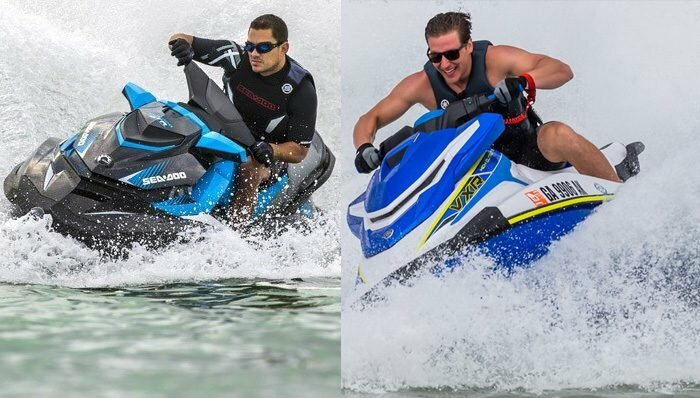 The longer stroke improves torque and low-end acceleration, and the power never fades in the turns or when skipping over waves. Despite the overwhelming performance slant, the craft still maintain’s Sea-Doo’s civilized personality. Intelligent Brake & Reverse (iBR) offers intuitive, stress-free handling around the dock or launch ramp, as well as provides rapid braking power at speed. Intelligent Throttle Control (iTC) allows the driver to choose a tamer acceleration curve when they don’t want the engine’s full brute force. An ECO mode is also available to save fuel. 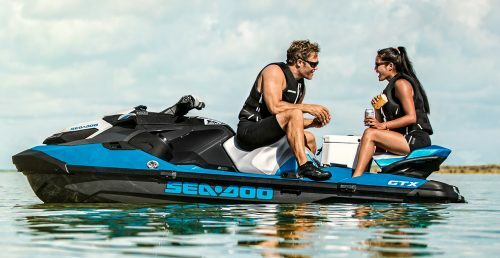 To that add Sea-Doo’s theft-prevention lanyard, wide-angle mirrors, front splash deflector, and new last year, redesigned grips with integrated palm rests. 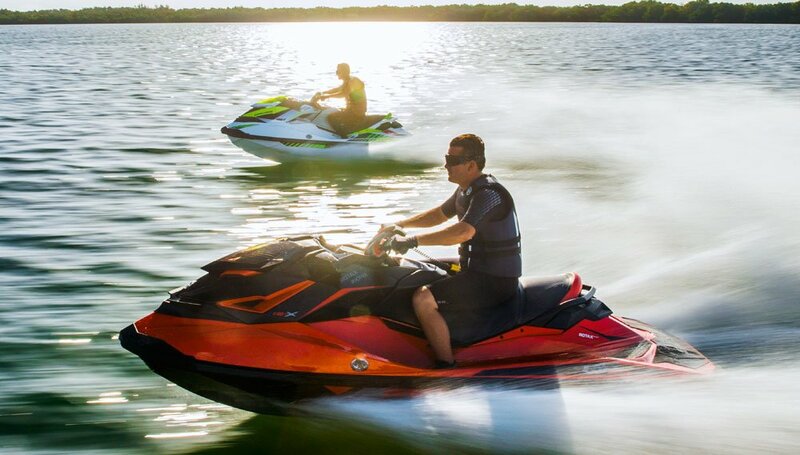 Clearly, boats like the RXP-X 300 aren’t designed for everyday riders; this level of power and handling demand respect. Ergo-Lock, however, makes the ride easier and more enjoyable for those performance enthusiasts by truly coming close to the idea of making the rider one with the machine. It also helps those riders ready to make that next step by providing a level of control not typical of such powerful machines. 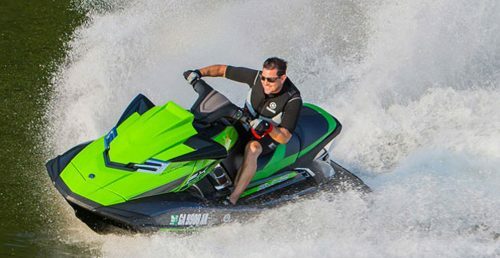 That’s a unique combo…and it’s the RXP-X 300’s greatest strength.